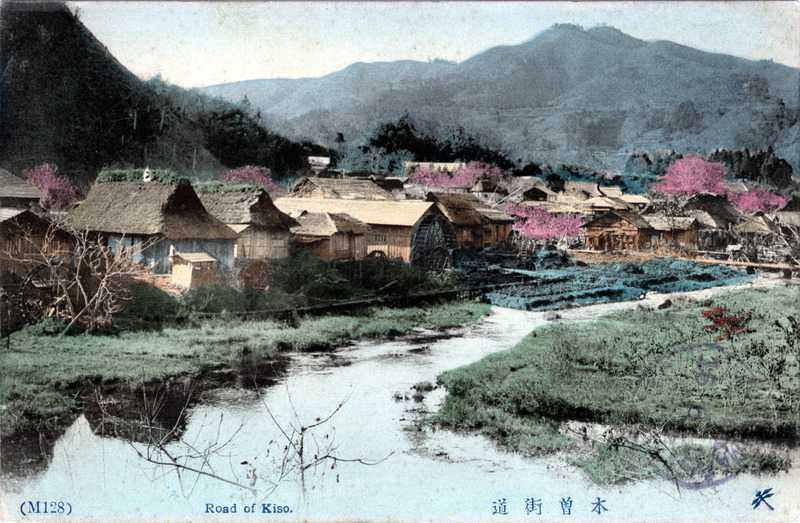 “Road of Kiso”, c. 1910. The road to Kiso runs about sixty miles through central Nagano Prefecture, following first the Narai and then the Kiso rivers. It is the heart of the 340-mile long Nakasendo (also called the Kisokaido) highway stretching from Tokyo to Kyoto. The Kisoji, the old trade route in the Kiso Valley, was most popular as a thoroughfare during the sixteenth through nineteenth centuries when travelers walked, rode on horseback, or were carried on palanquins through the mountains and over steep passes, and was the favored route of the imperial family, the nobility and their princesses, and the family of the shogun between the two capitals. “The Nakasendo, or Central Mountain Road, is so named in contradistinction to the Tokaido or Eastern Sea Road, and the comparatively unimportant Hoku- roku-do, or Northern Land Road in Kaga and Etchu, between which it occupies a middle position. It runs from Kyoto to Tokyo, passing through the provinces of Tamashiro, Omi, Mino, Shiushu, Koteuke, and Musashi. “The road seems to have been originally constructed early in the 8th century. Legendary history states, however, that in the reign of the Emperor Keiko (A. D. 71-130), his son, Prince Yamato-take, crossed over the Usui Pass during his conquest of Eastern Japan. suggesting the inference that some kind of track was believed to have existed there from the very earliest times. “The Nakasendo traverses mountainous, sparsely cultivated districts, remote from populous centres; and it used to be noted that the peasantry along portions of the route had a poverty-stricken appearance. But the recent wonderful development of the silk industry has done much to ameliorate their condition; and the accommodation is everywhere good, — judged, that is, from a country [rural] stand-point.